Marc Bauer, Ballade, Ville Ouverte (Walk, Open City) (detail), 2013, oil on Plexiglas, seventeen parts, each 12 5/8 x 17 3/4". 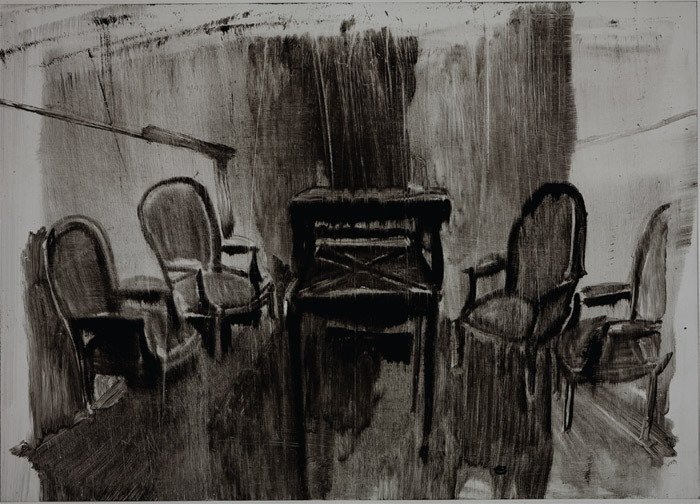 I don’t know to what degree Marc Bauer, a Swiss artist who lives in Berlin, was aware of the powder keg on which “Le Collectionneur” a series of drawings, dated 2012–13, concerning Paris under Nazi occupation rested. Even at a remove of more than sixty years, French public opinion has still not finished coming to terms with the anti-Semitic policies of the Vichy government and, in particular, with the administrative- bureaucratic machine that, in the period between 1940 and 1944, efficiently carried out the deportation of Jews and the plundering of their assets. France has never had the sort of controversy about coming to terms with the past (Historikerstreit) that marked Germany in the 1980s.